Dave further mentioned that he was using WSPR with a power of 1 W om 160 m.
I usually run WSPR with 1 watt here. Have been on 160 meter WSPR the last few days. Have received a 3 stations from the UK, two at 5w and one at 20w. The furthest my 1 watt has been heard is VE6 at 2994km from my QTH in Lousiana. Using a full size dipole for 160m. Here is a table with spots from Daves 1W WSPR signal from the 16th to the 28th of February 2015. K9AN at a distance of 1000 kilometer, received Daves signal 143 times. 45 Of these spots were received with a SNR of about -9 dB. Visit Dave's Blog entry on WSPR on 160 meters. * The Calculated lowest possible power is the power that could by received with a SNR of -29 dB. The stronger the signal the lower the Calculated lowest possible power. A signal with a SNR of -29 dB is a solid copy in WSPR. From time to time I visit the WSPR database to look for interesting spots that are made with very low power. But this time I was wondering, if there are many operators, that use much more than 5 watts. To my surprise only a few operators used 10 to 1000 watts. The WSPR spots are collected on 10 meters in 24 hours. I chose 24 hours to include all operators, that skip from band to band, following the changes in propagation, in all the parts of the world. The interval lasted from 9:02 utc on the 20th of February to 9:00 utc on the 21st. The choice for the band was not made consciously. I selected the 10 meter band, because in the days before, I made an analysis of spots on 10 meters. and the number of spots that were made with 10 to 1000 watts. 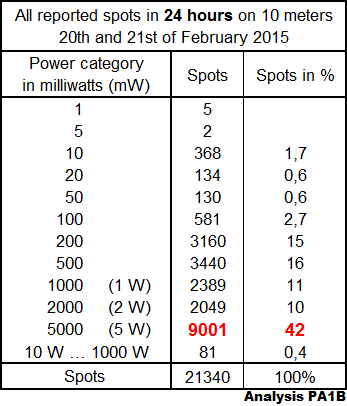 In the power categories from 1 milliwatt to 5 watts, most spots were made in the category of 5 watts. This is 42 % of all spots. I am pleased to see that many operators use 200 mW* or 500 mW. 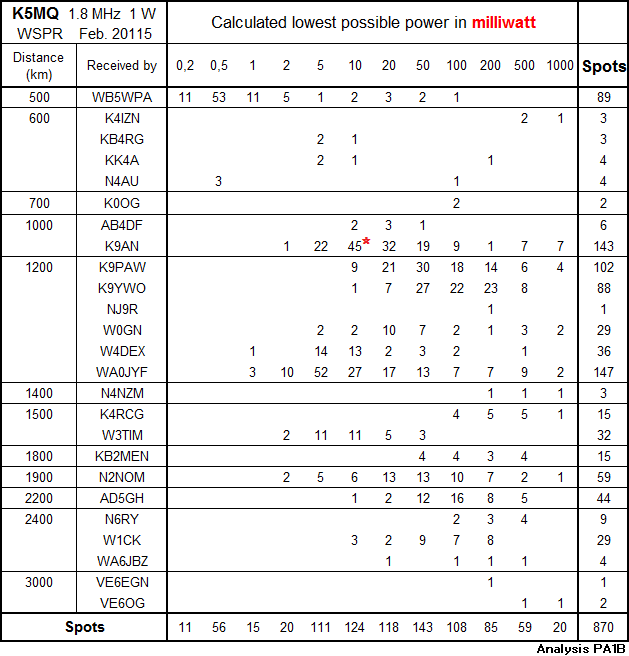 200 mW in 15% of all spots and 500 mW in 16% of all spots. Not all spots that show up in the database with 1000 W, are actually made with 1000 W.
In the past I have seen WSPR spots from an operator that used a homebrew QRP rig, that he proudly showed on QRZ. But the setting in his WSPR program was wrong. He discovered the mistake. Later the spots showed a power of 2 watts in stead of 1000 watts. hi. * Did you know that 200 mW in WSPR can be compared with 4 Watts in CW and 80 Watts in SSB. So with 200 mW in WSPR you can see where you 4 watt CW signal could be heard. hi. One wire of the ribbon of the Inverted V is damaged. With no wind all is OK, but . . . Frequently the wire does not connect briefly, when the ribbon moves in the wind. While transmitting the SWR jumps briefly and on receive, the signal disappears shortly. propagation is very good, and there is NO wind. hi. with just 360 mW. But then it took more than 5 times and 3 Watts to give my exchange, 599 UT. When the ribbon moves, the signal briefly disappears. because my call was received with 360 mW. After that QSO's, I made 2 x 5 QSO's in two runs of 10 minutes with S&P, all on 21 MHz. Not bad. I did not expected to make many QSO's on 7 MHz, since this is a busy band. Also I was convinced, that giving CQ would not work with the antenna in this state. So I answered a CQ on 7 MHz. Immediately after completing this QSO (with S&P), I was called by an other station. The station went up in frequency, so I followed and answered. After the QSO, 5 other stations came along, one after the other, without my calling CQ. This is very unusual for my, because in major CW contests, I often use the lowest possible power with S&P. hi. With no (or little) wind, I now decided to call CQ. So in the last hour of the contest I made many QSO's by calling CQ, between a few occasional gusts of wind. In total I made 50 QSO's. WOW. Even 2 QSO's were made with more than 1000 Miles per Watt, using QRPp.